About a month ago, I posted about a retro-style terrain editing interface that I was playing with. As an alternative, I’ve been playing with this alternate interface. It works exactly the same way as that one (it’s even the same underlying code), but using glowing “energy grid” to show where the region borders are, so you can do the editing from the main view. My only real worry is that I don’t think I can update that much terrain in real time. It was really simple in the ‘retro’-style view, where each region only consisted of a couple hundred triangles. Here, we’re talking about tens of thousands which need to be recalculated and modified whenever you touch the terrain. I’ll be surprised if I can do that in real-time, except on high-end hardware. Which I don’t want to have to require. 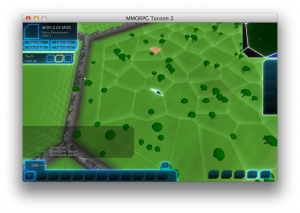 I might need to come up with a way to make terrain modifications be ‘queued up’, as part of the job system. You give an order, and eventually a developer comes along and actually do the work. Which would buy me time to do the terrain calculations in a background thread while that’s going on. But how to display a queued terrain edit command, I’m not sure. In this sort of view, I’m only drawing the “walls” for each region — not the ground. Maybe I need to draw where the ground would go, to make it more visible. But that gets into awkward visibility problems, particularly when you’re lowering terrain — how would you see how low you’re trying to make the ground, when that would involve drawing something underneath where the ground is now? 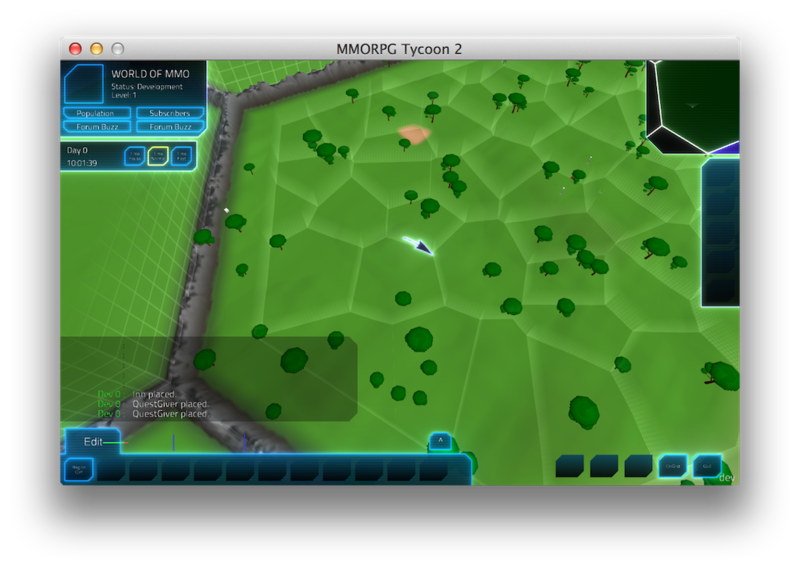 25 September, 2013 in Full Games, MMORPG Tycoon.